Have you ever seen children’s faces light up when you give them simple balloons? Imagine their faces when they get elaborate balloon sculptures of their favorite animals, cartoon characters or whatever else their little hearts may desire. We’re not talking your simple “puppy dog balloons” either. 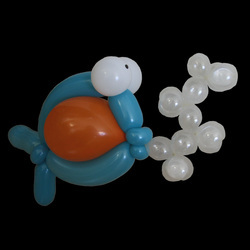 Ian Quick is a world class balloon twister who takes huge pride and delight in twisting beautiful and whimsical creations that are sure to astound young and old alike. Twisting has always proven to be one of the most popular attractions at festivals or large family oriented functions. Now’s your chance to find this out firsthand! Run for your lives! It’s a giant Keystone Cop!!! Actually, it’s Constable Quick of the LLPD (Long-Legged Police Department) making his rounds. Kids will laugh in delight as our tall officer directs foot traffic, pulls over babies in strollers for underage driving and issues fines to everyone else for being too short! Stilt walking is a time honoured tradition at fairs and festivals where the silliness and merriment are sure to ensue!